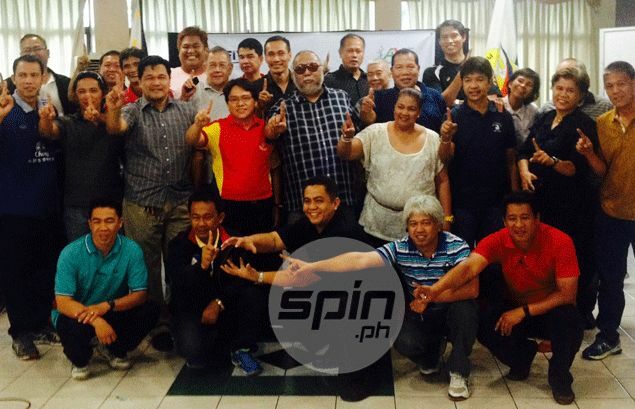 THE Philippine Volleyball Federation (PVF) went on with its election of a new board on Sunday despite the absence of recognition from the Philippine Olympic Committee (POC). PVF chairman Boy Cantada was once again elected to the nine-man board during the polls attended by about 40 members from two warring factions at the Philippine Navy Golf Club. The board will vote among themselves the new officers of the association, including the president, chairman, and secretary general. Also elected to the board for two-year terms are PVF president Karl Chan, former federation chiefs Victorico Chavez, Roger Banzuela, and Ricky Palou, and ex-national team member and broadcaster Mozzy Ravena. Rounding up the board whose term ends in 2016 are sports journalist Al Mendoza, Arnel Hajan, and Mariano Diet See. Chan got the most number of votes with 42, followed by Cantada (41), Banzuela (41), Chavez (36), Hajan (35), Mendoza (34), See (33), Palou (28), and Ravena (23). The PVF went ahead with the board election even without an official POC observer, a must for all national sports associations accredited by the country's highest Olympic body. The PoC recently withdrew its recognition of the PVF, on the grounds that the association has two sets of incorporation under the Securities of Exchange Commission. But the PVF said it will continue to work as the volleyball federation of the country even without POC recognition. "Ang amin lang is tuloy ang trabaho namin at programa. With the support of the volleyball community, we can't go wrong. There is nowhere to go but forward," said Cantada.